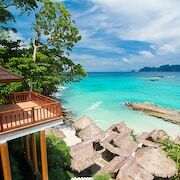 Situated in Ko Phi Phi, this hotel is steps from Monkey Beach and Loh Dalam Bay. Ton Sai Bay and Tonsai Pier are also within 10 minutes. Nestled on the beach, this Ko Phi Phi hotel is just steps from Ton Sai Beach and Ton Sai Bay. Tonsai Pier and Long Beach are also within 1 mi (2 km). 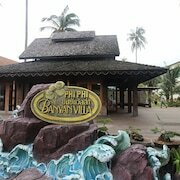 Situated near the beach, this hotel is within 2 mi (3 km) of Long Beach, Tonsai Pier, and Ton Sai Bay. Ko Phi Phi Viewpoint is 2 mi (3.2 km) away. Situated by the ocean, this hotel is within a 5-minute walk of Ton Sai Bay and Long Beach. 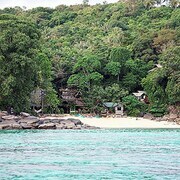 Tonsai Pier and Ko Phi Phi Viewpoint are also within 2 mi (3 km). Where can I find hotels in Maya Bay that are near tourist attractions? 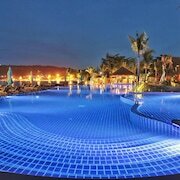 Maya Bay offers travelers and vacationers a generous assortment of great hotel possibilities to choose from. Expedia's extensive and up-to-date database lists 102 hotel options within a 0.1-kilometre (0.06-mile) distance of Maya Bay's central area. 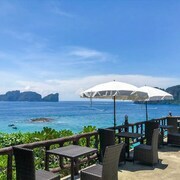 There are some Expedia-listed accommodations within a 10 kilometres (6 miles) radius, such as the Phi Phi Island Village Beach Resort and Arayaburi Resort Phi Phi. 12 kilometres (7 miles) away from the heart of Maya Bay, is the Villa 360. The Zeavola Resort is situated 12 kilometres (7 miles) away. 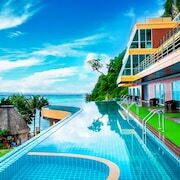 Alternatively you could book the Holiday Inn Resort Phi Phi Island or the Twin Lotus Resort & Spa by The Unique Collection. Looking for things to do? Why not spend a few hours discovering Khao Khanap Nam and Wat Kaew Korawaram, in Krabi, 45 kilometres (28 miles) to the north of Maya Bay. Should you wish to spend a night or two in Krabi, check out the Maritime Park & Spa Resort and Krabi City Seaview Hotel. Alternatively, you could stay in Krabi Town, 45 kilometres (29 miles) to the north of Maya Bay, where you can pick from the Thepparat Lodge Krabi and Krabi Royal Hotel. The Wat Tham Seua and Nosey Parker's Elephant Camp are just some of the more popular points of interest to check out for those visiting Krabi Town. If watching sport is a favourite pastime, be sure to take a trip to Ao Nang Krabi Boxing Stadium, which is 40 kilometres (26 miles) to the north of Maya Bay. If you are interested in booking a bed close by, make a reservation in the Rayavadee or Ao Nang Phu Pi Maan Resort and Spa. If you are planning on arriving or departing through Krabi International Airport, you may choose to book accommodation at Baansuan Rimnom Resort, or Palmari Boutique Hotel, both of which are close. What are the most popular Maya Bay hotels? Are there hotels in other cities near Maya Bay? What other types of accommodations are available in Maya Bay? Explore Maya Bay with Expedia.ca’s Travel Guides to find the best flights, cars, holiday packages and more!